BC High’s Peter Sugar shows the form that earned him second place in the slalom. A two-time Skier of the Year and three-time All-Scholastic, Bateman won the GS at the MIAA state meet and was second in the slalom. She teamed with Hannah Buckley to lead her team to a second-place alpine finish. She’ll attend Plymouth State. In what may have been the most exciting finish of the winter season, Cole won the MIAA nordic title by a half second. In the regular season the Harvard-bound senior and repeat All-Scholastic was third in Mass Bay Ski League East. The senior capped off his final season by winning the SkiEast regular season title for the second straight winter. At the state meet, he took fourth in the GS and sixth in the slalom as the Eagles finished fourth overall. Nottonson finished the regular season in first place in the Mass Bay West standings, then won the MIAA state title while leading A-B to a second-place team finish. A repeat All-Scholastic, he also competed in the Eastern High School championships. A repeat All-Scholastic, the junior again finished first in the Mass Bay West regular season. At the MIAA state meet she finished fourth and led the Warriors to their second straight team title. L-S also finished first at the Weston Sprints. Jampel is showing no signs of slowing up. One year after winning the MIAA state title she finished second by a half second this winter. The junior and repeat All-Scholastic also finished second in the Mass Bay Ski League East regular season. Smith was the Mass Bay Ski League East regular season champion and in the post-season finished sixth at the MIAA state championship. A three-time All-Scholastic, she’s a member of the New England Junior National team. She will attend Williams. Concord-Carlisle finished third at the MIAA state championship led by their junior captain. Yoder finished third at the state meet after finishing second in the Mass Bay West regular season. In her previous two years at states, she finished seventh and fifth. A repeat All-Scholastic selection, Buckley led her team to a second place finish at the MIAA state championships. The senior finished third in the GS and sixth in the slalom. The four-time Mass Bay West All-Star will attend the University of New England. The freshman made an impressive debut, finishing first in the SkiEast regular season. 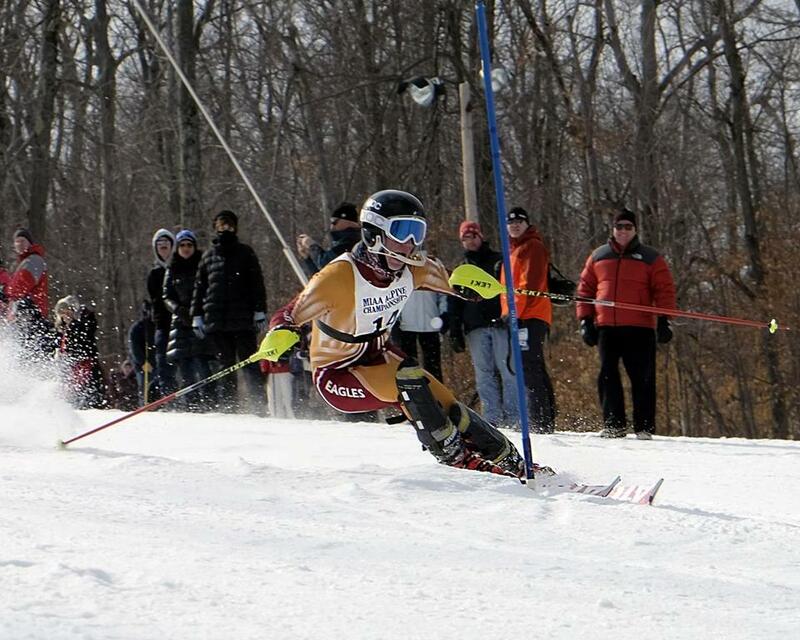 At the MIAA state championships, she was ninth in both the GS and slalom. Her efforts led Notre Dame to a third place team finish. She also plays softball. After transferring to Nobles from Burke Mountain Academy, the sophomore excelled in her first year of NEPSAC competition. Katz capped her season by winning the giant slalom and slalom at her first New England Tournament in Shawnee Peak, Maine. After finishing second in the North Shore Ski League regular season, the junior finished sixth in the GS and 11th in the slalom at the MIAA state championships. The team’s co-captain also took first place at the NSSL Interscholastics race. Though just a sophomore, Rubin is making her second All-Scholastic appearance after leading her team to the state alpine title. Rubin was second in the GS and third in slalom at the state championship. She also finished first in the MBSLE regular season. After a regular season in Mass Bay Ski League East in which she finished second, the two-time All-Scholastic finished 10th in GS and eight in the slalom at the MIAA state championships. The junior co-captain also plays lacrosse and will attend Boston College. Eyuboglu placed first in NEPSAC slalom and third in the giant slalom after winning all her regular-season ISL races. Eyuboglu was named first-team All-New England after leading Belmont Hill to a team win at the 2013 NEPSAC tournament. Led by Clay and his brother Ted, the Sachems finished third at the MIAA state meet. A senior, Clay finished third in the slalom. Soper was also second in the Mass Bay West Omega regular season. He’ll attend the University of Denver. Sugar finished second in the SkiEast regular season and at the state championship finished second in both the GS and slalom. His efforts helped lead BC High to a fourth-place overall finish. Last winter he took ninth in the GS. A repeat All-Scholastic, Thompson finished first in the Mass Bay Ski League East regular season. At the MIAA state meet he sixth in the GS and ninth in the slalom. He also competed for Massachusetts at the Eastern Alpine championships. The Colonials finished second at the MIAA state championships behind Guba and teammate Lewis Nottonson. At the state meet, Guba, A-B’s captain and an honor roll student, finished second. In the Mass Bay West regular season he also took second. The Patriots took third place at the MIAA state championships and Meyerson led the way. The junior was third at the state meet after a Mass Bay West regular season in which he finished third. Meyerson was also second at the Weston Sprints. A junior, Sibold was the Mass Bay Ski League East regular season champion. At the MIAA state championship the Raider captain took seventh place. A member of the National Honor Society, Sibold plays tennis, runs, and hopes to ski in college. Lunenburg finished as MIAA state co-champs in 2013 and had a second place finish this winter led by the Billerica High and ULowell graduate. Broden is in eighth year of leading the co-op team and has four consecutive Mass Bay West Omega titles. Lincoln-Sudbury won its second straight MIAA state nordic title this winter and with a young team you may be hearing from them in 2015. Alwan is a Lexington High School and UMass-Amherst graduate who is also a tri-athlete and plays soccer. Broderick’s fourth year was impressive, starting with a 12-0 regular season record in the North Shore Ski League. The Eagles then took second place at the MIAA state alpine championships, the third straight year the Danvers school has finished second. A Concord-Carlisle graduate, Burnham led the Patriots to an impressive third-place finish at the MIAA state nordic championships. In just hios second year, the Bates graduate also led Concord-Carlisle’s boys’ and girls’ teams to second place in the Mass Bay West finals. Mass. Bay East — Dover-Sherborn: Devon Laidman, Carter Mitchell. Duxbury: Tayler Kent, Katherine Quinn. Manchester Essex: Alexandra Marshall, Lizzie White. Marblehead: Audrey Meakin. Wellesley: Maggie McKenna, Samantha Rubin, Nell Solomon. Mass. Bay West — Acton-Boxborough: Corinne Johnson, Kirsten Thim. Bedford: Sarah Higgins. Belmont: Michelle Martin. Bromfield: Gabrielle Doben, Elizabeth Rooney, Sarah Rowse. Chelmsford: Carolyn Paul. Concord-Carlisle: Elisa Loy, Brianna Stout. Lincoln-Sudbury: Sandra Nygren. Leominster: Rachel Bateman, Hannah Buckley, Elizabeth Lahti, Meghan Lahti. Nashoba: Jenna Peabody. Westford: Natalie Bishop, Katie Stokes, Alexa Sullivan. Weston: Kayla Lucas. North Shore — Andover: Jackie Drew, Julia Ganley, Olivia Lawler. North Andover: Cameron Deery, Olivia Kililea, Juliet McFadden, Jenna Royal, Hannah Twadelle. Ski East — Cohasset: Mackenzie Axelson, Caty Gilman. Hingham: Izzy Calianos, Halle Sullivan. Needham: Sofia Kurd. Norwell: Caroline Richards, Gretchen Webb. Notre Dame (Hingham): Morgan Crowther, Kali Flaherty, Victoria Mulkern. Mass. Bay East — Brookline: Charlotte Cole, Isabel Cole, Gabrielle Vandendries. Dover-Sherborn: Phelan Shelby. Newton North: Sonya Jampel. Wellesley: Katie Pedersen, Hannah Rieders, Madeline Rieders, Claire Sibold, Rebecca Smith. Mass. Bay West — Acton-Boxborough: Maggie Foley, Mary Lagunowich, Molly Salant. Concord-Carlisle: Sabrina Bohrer, Meg Yoder. Lincoln-Sudbury: Clara Cousins, Phoebe Seltzer, Talia Seltzer. Wayland: Audrey Zizza. Westford: Allie Skahen. Mass. Bay East — Dover-Sherborn: Bailey Laidman, Chris Miner, Sam Scatchard. Marblehead: Kyle Maulden, Charlie Thompson. Wellesley: Michael Carbonaro, Jack Mckenna. Xaverian: Jack Carmone, Sam Goldberg, Ryan Pratt. Mass. Bay West — Acton-Boxborough: Nicholas Duncan, AJ Higgins. Belmont: Sam Burt. Bromfield: Peter Donaldson. Chelmsford: Conor Hart. Concord-Carlisle: Jake Mulligan, Nick Solomon. Lincoln-Sudbury: Austin Barta, Tim Carlough, Jack Costello. Wayland: Will Regan, Ben Slater. Westford: Ben Antes, Benjamin Cassidy, Colin Cressman, Connor Freud, James Larsen. Weston: Peter Rowe. Winchester: Clayton Soper, Ted Soper. North Shore — Andover: Jake Tarricone. Masconomet: Tyler Brown, Mitchell Godett, Nathaniel Houston, Nolan Houston, Jay Kraunelis. St. John’s Prep: Ryan Carlucci, Joe Cavallaro, Peter Griffin, Pat McDermott. Ski East — BC High: John Marquardt, Michael Mullaney, Brian O’Neill, Peter Sugar. Hingham: Dylan Redman. Natick: James Traficonte, Caleb Winn. Needham: Zach Arvin, Emerson Boyd, Matt Chmielewski. Mass. Bay East — Brookline: Jordan Fried. Dover-Sherborn: Connor Rockett, Leland Sky. Newton North: Ned Martenis, Rafi Razzaque, Connor Rockett, Brewster Taylor. Wellesley: Michael Mariscal, Ben Scammell, Mark Sibold, Ben Weinberg. Mass. Bay West — Acton-Boxborough: Mark Borghesani, Eric Guba, Rory Lowe, Lewis Nottonson, Charles Watt. Concord-Carlisle: Jacob Meyerson. Wayland: Eli Bucher, Paul Longnecker. Westford: August Posch. Winchester: Sam Veggeberg.